A little help from her friends transformed Tongan support worker Ainise Toupili from someone who hated reading anything in English to a confident learner with a Level 3 Health and Wellbeing qualification under her belt. Ms Toupili, who is a full-time support worker for home-based healthcare provider Pacific Homecare, recently took part in a Peer Mentoring programme overseen by industry training organisation (ITO) Careerforce, as part of a national research project exploring ways to boost the success of Pacific learners engaged in workplace training. The research report, Pacific Learner Success in Workplace Settings, found that Pacific learners engaged in workplace training have the best chance of success when they are part of a supportive team learning environment. Ms Toupili strongly agrees with the report’s findings. “Group study was really helpful for us Islander learners, especially because we could discuss the assessments in our own language and help support and motivate each other to keep going,” she says. Ainise Toupili took part in a pilot study on Pacific learner success in the workplace and says group study is great for Islander learners. “When we study on our own, sometimes we get lost and can’t understand the questions, but when you hear other people talk about it, that’s when everything makes more sense,” she says. 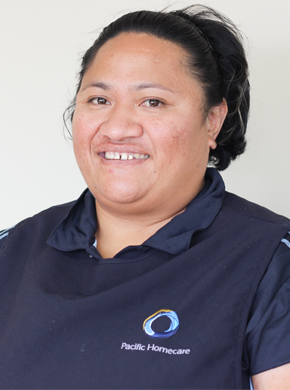 As well as attending the regular workplace-based group study programmes run by her employer, Pacific Homecare, Ms Toupili also organised additional study sessions with her colleagues outside of work, either at her home in Otahuhu or at a colleague’s house. “We had a 64-year-old lady in our group, she didn’t want to try the Level 3 qualification because she said she was too old, she couldn’t read English, but we convinced her to give it a go and she did really well,” Ms Toupili says. “So, the study groups are really good and I think every workplace should organise something like this when people are engaged in workplace-based training. Everyone knows how to do their job, but the limit is the language barrier. If we can get past the language barrier, then training and qualifications really help us with our performance, it builds our knowledge and we can do our job so much better. At that time, Ms Toupili’s group were studying the New Zealand Certificate in Health and Wellbeing (Level 3), a workplace-based training programme developed by their ITO Careerforce and facilitated by Pacific Homecare. Now, Ms Toupili says herself and several others in her group have gone on to study the Level 4 qualification and hopes to continue her professional development journey. “Because I’m a single mum with three kids, I have nine-year old twins and a 5-year-old, I really want to keep studying because I love my job and the training. She says one of her biggest personal challenges was overcoming a dislike of reading anything English. “My weakness is reading in English – reading books is not my thing. So I set myself a goal late last year and now I’ve finally finished a book – it was an English bible and now I’ve finished it. Careerforce, the ITO for the health, community and wellbeing sectors, collaborated with three other service ITOs, ServiceIQ, Skills and Competenz to develop and facilitate pilot programmes to help better understand how to support Pacific learners to succeed in industry-based training programmes. The full findings of the research study, commissioned by Ako Aotearoa, the National Centre for Tertiary Teaching Excellence, will be launched at the New Zealand Pacific Tertiary Education Forum in Manukau on September 28.